The MWCC's "Masterplan" has been shredded. Years in the making, built upon the work of Skyway (and to a lesser extent other schemes), it was technically feasible, offered economic and environmental benefits, and gained significant public support. But the Masterplan's benefits were greatly overstated, its costs were unstated, its offensive and divisive qualities were smothered with greenwash and after failing to convince (and losing the landholder consent of) Carlton and United Breweries, it was abandoned. The MWCC referred to the Masterplan as "the Dog Legs" route saying "the MWCC is proposing a two-staged journey that dog-legs around residential areas to avoid privacy concerns." (Privacy concerns did not disappear because the route only "avoided going [directly] over rooftops" of houses. Planned to be alongside the Brewery, the works included a 3-storeyed car park, a bus turning circle, and the base station building. The Brewery said "No." Gondolas departing from the Cascade Brewery were to stop at a mid station, a weed-infested hillside on CUB's estate, beyond which is the Hobart tip. 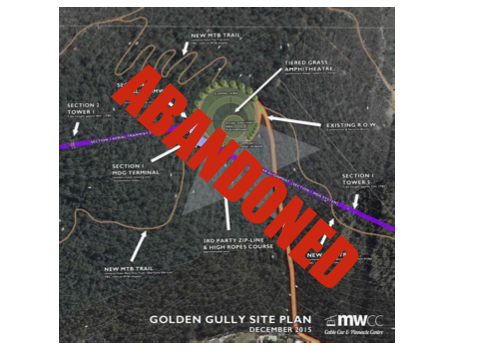 The MWCC suggested "possible third-party installations" like "an all-ages tree-top rope course & zip line" (removed in 2018) leaving only new weeds (an "outdoor lawn venue") with barbecues and picnic areas and—wait for it—a cable car motor room tour. All redundant. The journey to the mountain from the foothills would recommence in a "sky bus" (see Visual Impacts) that dog legged left and entered the Mountain Park on a straight-line route toward the Organ Pipes. The users would have a minute to take in the magnificent vista of cliffs. The majesty for track and road users below (and Hobartians generally) would, however, be profoundly defaced. A landscape architect pointed out the unavoidable dilemma of building on top of a mountain. "The mountain is vertical, buildings are linear. Integrating them is extremely challenging." The cable car would end in a concrete lair the proponents declare an "enhancement" of the mountain. The building is several stories high: sixteen times the size of the existing observation shelter, explored here.